See http://www.shsu.edu/~chm_tgc/primers/pdf/GE.pdf for a PDF version of this document. Gel is amended with SDS to dissociate & charge proteins. 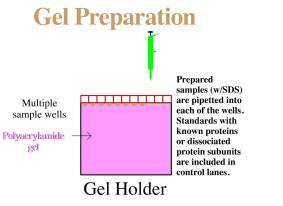 Prepared samples (w/SDS‹sodium dodecyl sulfate) are pipetted into each of the wells of the gel/slab holder. Electrodes are already plumbed into the gel holder above and below the gel and they contact the gel via a liquid buffer (not shown). 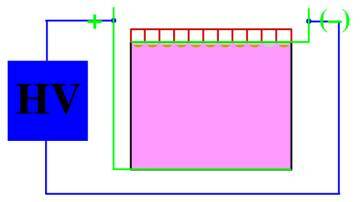 The connectors are electrically isolated from each other but contact opposite edges of the gel. "Running the gel" involves connecting the electrodes to the power supply. Heat is generated during the run and passively dissipates or is removed via (a water-powered) cooling chamber sandwiched against the gel. Higher current generates more heat. The far lanes on the gel's left and right below are standards (this word is red) and each of the inside lanes are samples (this word is purple) in duplicate. One lane is unused. After the run, these bands can be examined only after an appropriate dye or imaging/development technique is used. A tracking dye can be added in the buffer to visualize the mobility front to help decide when to stop the run. If pre-stained standards are used their bands can be seen as the electrophoresis proceeds. 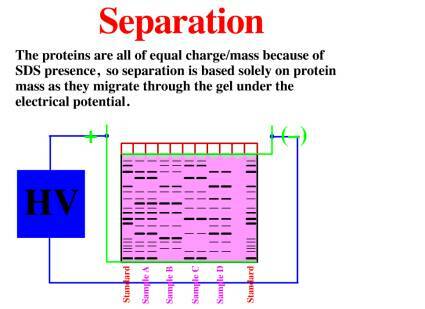 In this form of gel electrophoresis, the proteins are all of equal charge/mass because of SDS presence, so separation is based solely on protein mass as they migrate through the gel under the electrical potential. A band's identification is made by comparison of its position on the gel with that of a known band in the nearby standard's lane. This is accomplished with a plot of log molecular weight vs. relative mobility. And a band's intensity gives a measure of protein in that band. "Slab-gel electrophoresis"; 2000; F. W. Studier; Trends Biochem. Sci. ; v25; 588-590. Detail: This is an excellent short historical overview of the development of gel electrophoresis by one of the pioneers, F. William Studier. "SDS polyacrylamide gel electrophoresis"; 2000; J. V. Maizel, Jr.; Trends Biochem. Sci. ; v25; 590-592. Detail: An excellent discussion of the immediately obvious success of SDS PAGE over the older tube gel method by early experimenters with this method. "Comparison of slab gel electrophoresis and capillary electrophoresis for the detection of the fluorescently labeled polymerase chain reaction products of short tandem repeat fragments"; 1998; D. Deforce, R. Millecamps, D. Van Hoofstat, E. Van den Eeckhout; J. Chromatogr. A.; v806; 149-155. Detail: The sizing capability of slab gel electrophoresis was compared to that of capillary electrophoresis (CE) for short tandem repeat fragments. "Analysis of clinically relevant, diagnostic DNA by capillary zone and double-gradient gel slab electrophoresis"; 1998; P. Righetti and C Gelfi; J. Chromatogr. A; v806; 97-112. Detail: Novel denaturing gradient gel electrophoresis methods are described. Simultaneously porosity and denaturing gradients are applied in a single gel.